Pure Micas don't tend to work as well as some pressed shadows and pigments from brands like MAC, because they don't adhere very well to the skin. Under most circumstances, I wouldn't recommend buying micas for use straight-up as a shadow since they don't perform that well. 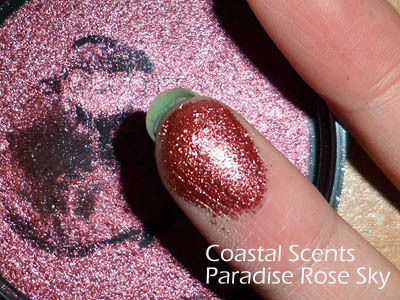 The shade I'm featuring today is Paradise Rose Sky (a sample costs only $1 right now), a gorgeous burnished wine-red with rose undertones and a coppery sheen. This would contrast very well with blue and green eyes, but as I always remind everyone; don't limit your shade choices based on your eye color because eye makeup is NOT JUST about having max contrast with your eyes shade. Step 1: For definition and that cat-eyed wing, I'm using a plum colored pencil first. To create the shape I did, you just run the pencil from the center of the lower lid outwards along the lash line, and then extend straight up at the same angle. Step 2: Draw a line from the outer end of the line you drew earlier, and pull it diagonally in and down, until it touches the inner corners of our eye. As you draw the line, it will be quite straight. It just appears curved in the image due to the contour of my eyes. Finish by coloring in the space within the wing. Step 3: Using a flat brush, I packed Paradise Rose Sky pigment onto the lid from outside in, first filling in the mobile lid area, within the socket line (hollow curve arching above your eye ball). I colored higher than the upper edge of the penciled wing earlier and only covered the upper portions of the purple pencil. 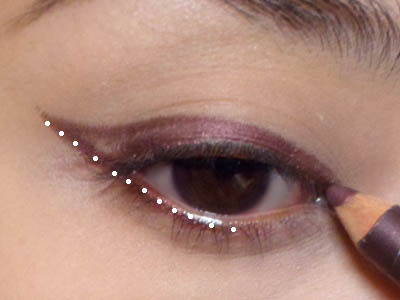 This is to give the color a slight gradient effect, from defined plum below to smoky red at the top. Leave the inner corner of the lids bare. 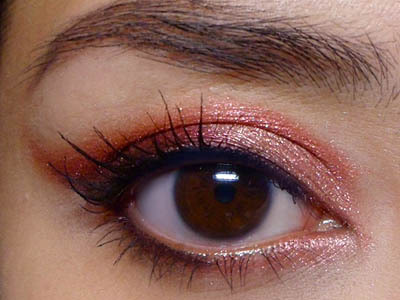 Step 4: To lighten up the look a little, I packed a softer peach-pink (L'oreal Infallible in Forever Pink) onto the inner corners of the lid, smoothing into the coppery-red.